Seattle duo Bell Witch have generated considerable buzz with their engrossing take on funeral doom since releasing their demo in 2011. The unexpected death of founding drummer Adrien Guerra left the project’s future in doubt, but songwriter and bassist Dylan Desmond enlisted Jesse Shreibman (whose live work for Wrekmeister Harmonies speaks for itself) and the two began writing and debuting material while on tour. These live sessions would become a magnanimous 84-minute eulogy to the band’s fallen member wrapped in a gorgeously orchestrated ode to the mystifying dread experienced as life ebbs away. Mirror Reaper is funeral doom at its deepest and most morose, but the massive song isn’t just impressive for its length. Patience, intuition, and musicality raise it to a league of its own. Using the dreary minimalism on which the band built their reputation, save the addition of a foot organ, Bell Witch’s attention to detail both in production and execution becomes even more apparent. In spite of its daunting duration, Mirror Reaper functions surprisingly well as a song. Its two movements, (which together form the phrase “As Above, So Below”) remain connected through melodic motifs, yet profoundly distinct in their effect. 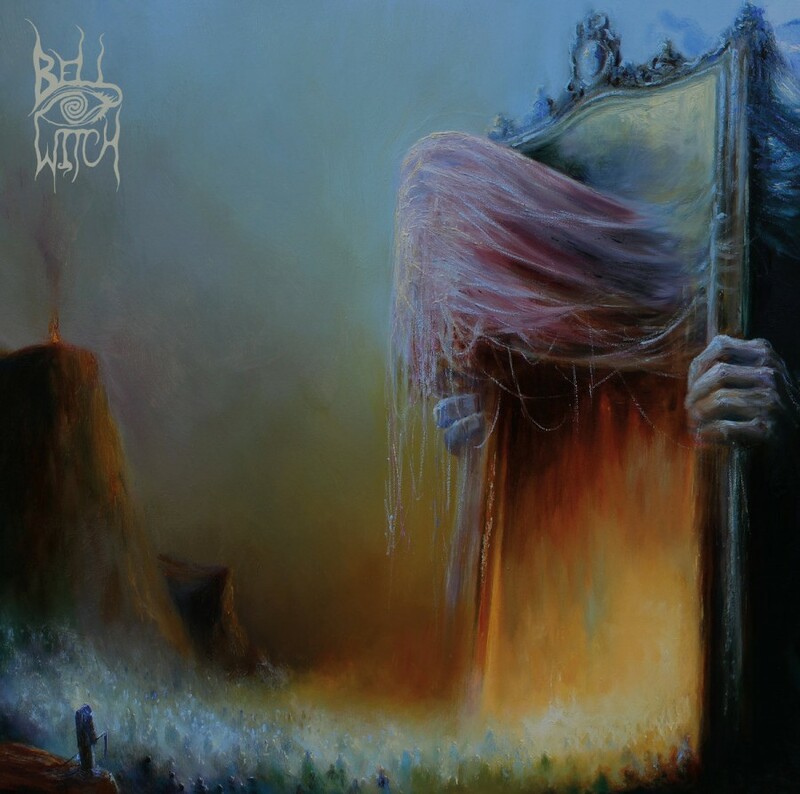 Bell Witch likens the album’s structure to that of its namesake, as its second half is an altered reflection of the first — bringing Mirror Reaper to life in its fascination with death. It goes farther than inviting listeners to stare into the abyss, but embodies the tragic epiphanies one has on the brink of oblivion. Desmond’s harmonic instincts have always set Bell Witch apart from the funeral doom crowd (especially considering it all comes from his voice and six-string bass), but the way his voice commingles with his instrument on Mirror Reaper in the aforementioned passage is nothing short of spectacular. Over open bass chords, Desmond’s soft yet steady singing completes the chord’s missing interval — creating beautifully flowing modulations. An evolving soundscape evoking gregorian chants as much as it does epic post-rock illuminates the plight of a soul in limbo between mortal life and what lies beyond. As vocal lines layer over each other, Shreibman’s suspended cymbal swells and foot organ drones eventually cadence the song back into distorted dirge while retaining the transcendent elements — cementing Mirror Reaper as a peak for the band. Funeral doom stands apart from metal stereotypes in that its exploration of death goes beyond something to deal or be dealt, instead exploring the philosophy behind finality and the combination of fear and serenity it entails. Since Funeral’s first demo sparked the genre into existence, no band has embodied a metallic procession quite like Bell Witch. The duo have done to funeral doom what Sleep did to stoner metal with Dopesmoker — taking the genre to its limits while epitomizing its potential on a grand scale. Mirror Reaper will be remembered as a triumph for this movement, an encapsulation of its most moving attributes.